Reuters (Essaouira, Morocco, June 23, 2013) — Every year, the annual Gnawi music festival in the windy Atlantic city of Essaouira attracts thousands of visitors from Morocco and abroad. At the weekend (June 20-23), musicians and audiences celebrated the sixteenth edition of the festival. Morocco’s Gnawa are heirs to a musical and spiritual tradition brought north across the Sahara centuries ago by black slaves. In recent years, they have been enjoying new fame as their hypnotic rhythms hook listeners across the world. The Gnawa brotherhoods have long scraped a living on the margins of Moroccan society by offering to restore health or good fortune through séances of trance and incantation. “In the past, this music was limited to the people who knew it and danced to its rhythms. It was appreciated only by those who knew its secrets. They were organizing small concerts known as Gnawi nights. These concerts were taking place inside homes on religious occasions such as the month of Shaaban or during moussems or festivals but today, this music has become something completely different,” Gnawi master Mahmoud Guinea explained. The Gnawa symbolize the rich cultural mix of a country at the crossroads of Africa, Europe and the Arab world. And Gnawa music fuses well with other styles, such as blues and jazz whose roots also lie in sub-Saharan Africa. Andre Azoulay chairs the organization behind the festival. He says American jazz singers recognized the links between Gnawa music and soul and blues a long time ago. 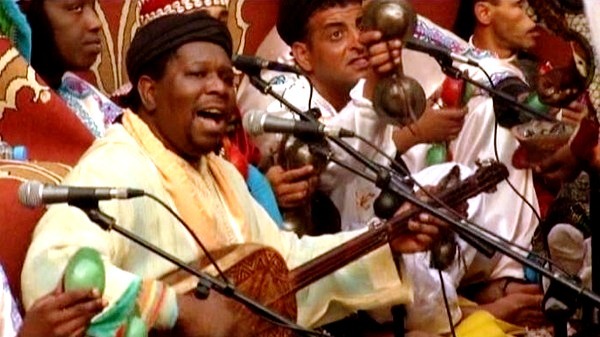 Every year the festival invites musicians from other parts of the world to play alongside the masters of Moroccan Gnawi music. On Friday night, Mahmoud Guinea who comes from a Gnawi family based in Essaouira played alongside Omar Sosa and his quintet from Cuba. Tens of thousands of people watched the concert and some of them went into a trance. “It is simple. We are some of the same model: Africa. So this is the father, I am the student. So I follow the father and everything happened with love, with heart, with soul, with emotion,” Omar Sosa said. The next challenge for the festival organizers is to try and preserve what has so far been an oral tradition. Festival director Neila Tazi explained that the festival has begun to record Gnawa music and transcribe its lyrics. She hopes that the United Nations Educational Scientific and Cultural Organisation UNESCO will support the project. Critics say the Gnawi’s new fame has severed the music from its spiritual roots, turning it into disposable folklore. They say the split began when hippies visiting Essaouira in the late 1960s asked a famous Gnawi, Abderrahman Paca, to organize a ‘lila’ ritual at their seaside villa. It widened when the Essaouira festival appeared in 1997, mixing Gnawa with music that had no obvious spiritual function. But supporters say the festival has restored the Gnawi’s standing and saved their musical tradition from extinction.